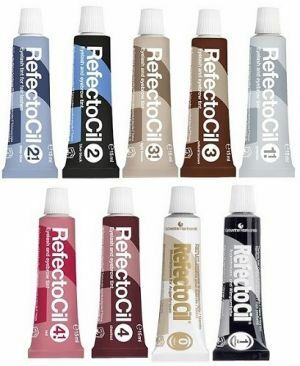 RefectoCil is the expert for eyelash and eyebrow tints. Deep black: Especially recommended for eyelash tinting and for eyebrows on black or dark brown hair - for the most beautiful black styles of all time! Graphite: For even natural coverage of grey or white hair or to give other RefectoCil colours a cool, ashy tone. For timeless styles! Blue black: A black tone with a bluish shimmer that provides extra colour depth and brilliance especially for eyelash tinting! Deep blue: Deep blue is an intense dark blue tone, especially for the eyelashes, which complements blonde or light blonde looks in a fascinating way! Natural Brown: Natural Brown is a versatile brown tone that covers powerfully and naturally creates brunette looks! Light brown: Light brown is a versatile, naturally light brown tone that enhances the brilliant effect of dark blonde to light brown hair. For shiny styles! Chestnut: Chestnut gives eyelashes and brows a warm brown tone with a subtle red component and gives them that certain something! Blonde Brow: With Blonde Brow dark eyebrows can be lightened up to 3 levels. For natural blonde styles!